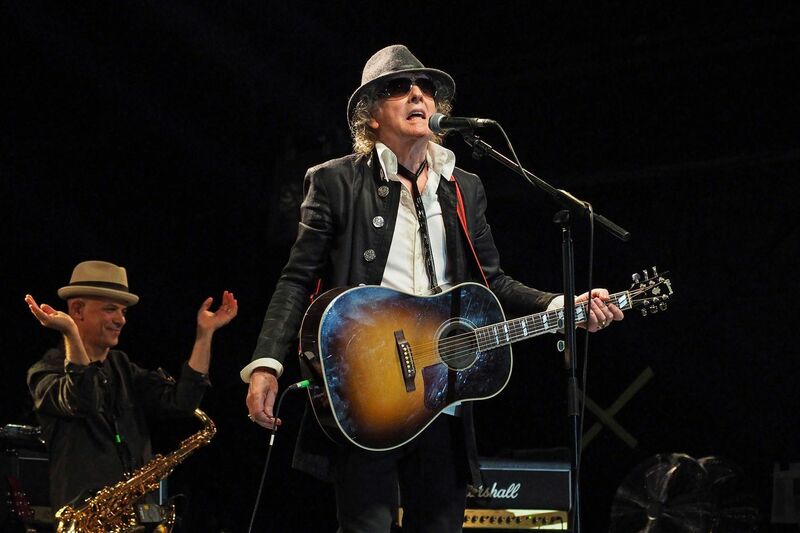 Ian Hunter will lead Mott The Hoople '74 in the band's first U.S. tour in 45 years when they play the Keswick Theater in Glenside on Monday. James Mastro is also pictured. “Suffragette City” wasn’t good enough for Mott the Hoople. When David Bowie decided to rescue his favorite British rock-and-roll band after they split up in early 1972, he first offered them a song that would become one of his signature hits from his album The Rise and Fall of Ziggy Stardust and the Spiders from Mars. “We already had songs as good as ‘Suffragette City,’ ” says the Mott frontman, who will lead a version of the glam-rock-era band billed as Mott the Hoople ’74 at the Keswick Theatre on Monday. The date, which features reunited 1980s Paisley Underground band the Dream Syndicate as openers, is part of an eight-show U.S. tour that’s the first for Mott in 45 years. The reason Hunter passed on “Suffragette” was simple. He knew Mott the Hoople, which had already released four albums that failed to break through to a wide audience, needed something extraordinary to do the trick. Bowie provided just that with the second song he offered Mott, which he played for the band on acoustic guitar with his legs crossed, sitting on the floor of a Regent Street publisher’s office in London. That song was “extra special,” Hunter recalls. It was “All the Young Dudes,” the title cut from Mott’s breakout Bowie-produced album. “Dudes,” delivered with a surfeit of snide attitude by Hunter, became an anthem for glam-rock fans of the 1970s, throwing shade at their ‘60s forebears (“My brother’s back at home with his Beatles and his Stones / We never got it off on the revolution stuff, what a drag”). It’s a classic-rock classic that Hunter and Bowie later sang together at a Freddie Mercury tribute concert in 1992. And last weekend, Hunter — whose long, fruitful career deserves Rock and Roll Hall of Fame consideration — joined Def Leppard, the Zombies, and members of Queen and the Bangles to sing it at the Rock Hall induction ceremony at the Barclays Center in Brooklyn. In ’72, “All the Young Dudes” also launched Mott the Hoople as American concert headliners, with the band playing its first-ever top-of-the-bill show at the Tower Theater in Upper Darby. Morgan Fisher, Ian Hunter and Ariel Bender in a composite photo of Mott The Hoople '74. That tour is also chronicled in a book Hunter wrote, Diary of a Rock ‘n’ Roll Star. A highly enjoyable account of Mott’s ’72 trek across the U.S., Diary — which British rock mag Q over-excitedly has called “the greatest music book ever written” — is a time capsule and treasure trove for rock history buffs. It tells of Mott’s stop on the spinning stage at the Valley Forge Music Fair and a visit to the C.F. Martin Guitar factory in Nazareth, Pa., as well as tales of listening to Al Jolson on the jukebox at an “all-night hamburger cafe” in Center City with Bowie, discussing the New York Dolls and Iggy Pop. When Mott got its Bowie boost, Hunter was already a journeyman in his early 30s. Born in 1939 in Shropshire, England, he spent World War II with his mother and aunt in the relative safety of Scotland. “Jerry Lee, he was the one for me,” Hunter says. On “Long Time,” the closing cut on his terrific 2016 solo album Fingers Crossed, he sings “I wasn’t born in the U.S.A., but I’m that way inclined.” He uses Connecticut as a home base for frequent tours with his backup Rant Band, but says his heart lies “somewhere south of Memphis,” or more specifically, Faraday, La., where Lewis was raised. During the 1960s, Hunter played in bands that offered a respite from factory work to travel to play in clubs “run by the German Mafia.” In 1969, he auditioned for a band called the Silence that included guitarist Mick Ralphs and bass player Pete Overend Watts. He got the job. When Watts contacted Bowie looking for a gig because Mott had called it quits, “the inimitable superstar” as Hunter calls him in Diary, persuaded them to get back together. The band’s run of post-”Dudes” success didn’t last long, but it had an impact. Queen opened dates for the band on its American tour in 1974. “Raw, fun, angry, glorious, and jazz: Mott was everything,” guitarist Brian May has said. And a teenage Mick Jones, who went on to form the creative core of the Clash with Joe Strummer, followed Mott around England, sneaking in to shows. Jones produced Hunter’s 1981 album Short Back n‘ Sides. Mott the Hoople went through many lineup changes, and Hunter went solo in 1975. His “Once Bitten Twice Shy” from that year was a hit in 1989 for metal band Great White. “Cleveland Rocks,” from 1979’s You’re Never Alone with a Schizophrenic, which featured contributions from Bruce Springsteen’s E Street Band, became the theme song to The Drew Carey Show, in a rendition by the president of the United States of America. Hunter has a Philadelphia memory of playing the Spectrum with guitarist Mick Ronson while touring Schizophrenic, opening for the Kinks. “They left us three feet in front of the stage for all our gear,” he says. “Then [longtime Philadelphia concert promoter] Larry Magid says, 'Just tell them you ain’t going on unless you get 10 feet. They can’t tell you what to do.’ So that’s what we did.” It all worked out in the end. The first Mott reunion was in London in 2009 with original members. “Those shows were great, but they didn’t include Morgan and Luther, because they weren’t part of the original five,” says Hunter. He’s referring to keyboard player Morgan Fisher and guitarist Luther Grosvenor (also known as Ariel Bender, a stage name derived from the delinquent practice of bending car antennas). Looking back, Hunter says, “Rock and roll gave me life. When I was young, I didn’t really know what I was for. I wasn’t really good at anything. Mott the Hoople ’74 with the Dream Syndicate at the Keswick Theatre, 291 N. Keswick Ave., Glenside at 8 p.m. Monday. $49.50-$125. 215-572-7650.